Welcome Back For Spring & Summer! Orange Beach Sunset Sailing Charters offers year-round private and shared expense sailing charters for vacationers staying in Fort Morgan, Gulf Shores, Orange Beach, Alabama and Perdido Key, Florida. We carry a maximum of 6 people on our sailboat, The SAILob. OB is for Orange Beach and our name is pronounced "Sail Oh Bee." Most of our sunset sailing charters are made up of people just like you and your family. Watching the sun set over the Alabama coastal waters while you are sailing is a breathtaking experience. There is nothing better than sharing that sailing experience with the one you love or your family. Orange Beach Sailing Charters offers laid back sailing charters that stimulates the entire family. You can relax and unwind as the gentle ocean breeze fills our main sail and catapults you into one of the quietest places you have ever been. You feel the wind blowing over our upper deck and through your hair. Imagine closing your eyes for a moment. You will feel the warmth of the afternoon sun touching your face and taking you away to another place in time. 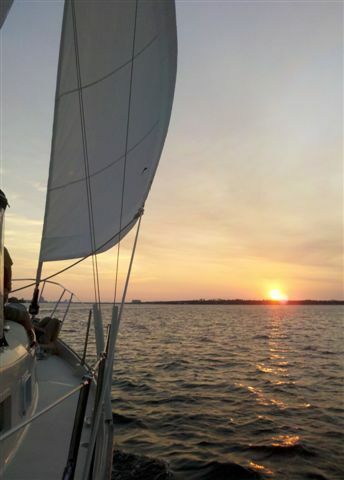 Sunset sailing allows you watch the Summer Sun as it sinks below the Gulf Shores horizon. The smell of the salt air and the sounds of nature are two of senses that will be stimulated when you join us on one of our sunset sailing adventures. From time to time, we all experience hectic lifestyles and jobs. Being in a relationship, getting married, raising children, paying bills and working long hours are all things we have experienced at one time or another. We all remember when times were simple and things that once mattered, now do not. Sunset sailing charters in Orange Beach is a wa y to step back in time. Sailing offers those of us with the most hectic lives, a chance to relax, rejuvenate and unwind. Having a chance to enjoy something that is so pristine as a sunset sail, will make you leave all of the headaches behind. So, turn off your cell phone and leave it in your Orange Beach condo or hotel room for a few hours. Come along with Orange Beach Sailing Adventures and let us help you escape reality and enter into a whole new world of Gulf Shores vacations. You will be amazed how good you will feel while you are spending some private time with the ones you love. The most beautiful white sandy beaches are located on the Alabama Gulf Coast. We have 32 miles of pristine beaches you can look at from a whole new perspective from the water. Sailing with us, will allow you to see the Alabama beaches from a whole new perspective. You will see first hand all of the amazing things that makes Orange Beach Sailing Charters unique.